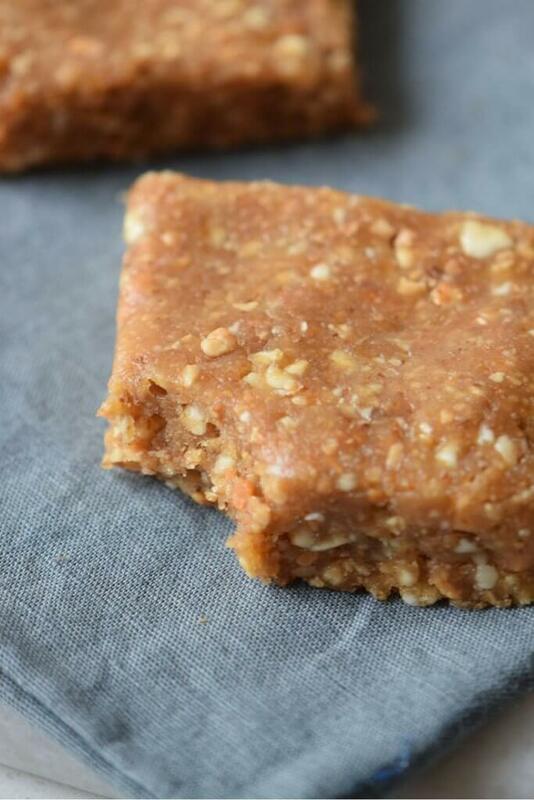 What’s inside: An easy, no-bake protein bar recipe that only requires three ingredients! Nuts are one of my favorite ways to get healthy fats and proteins into my (and my daughter’s) diet. 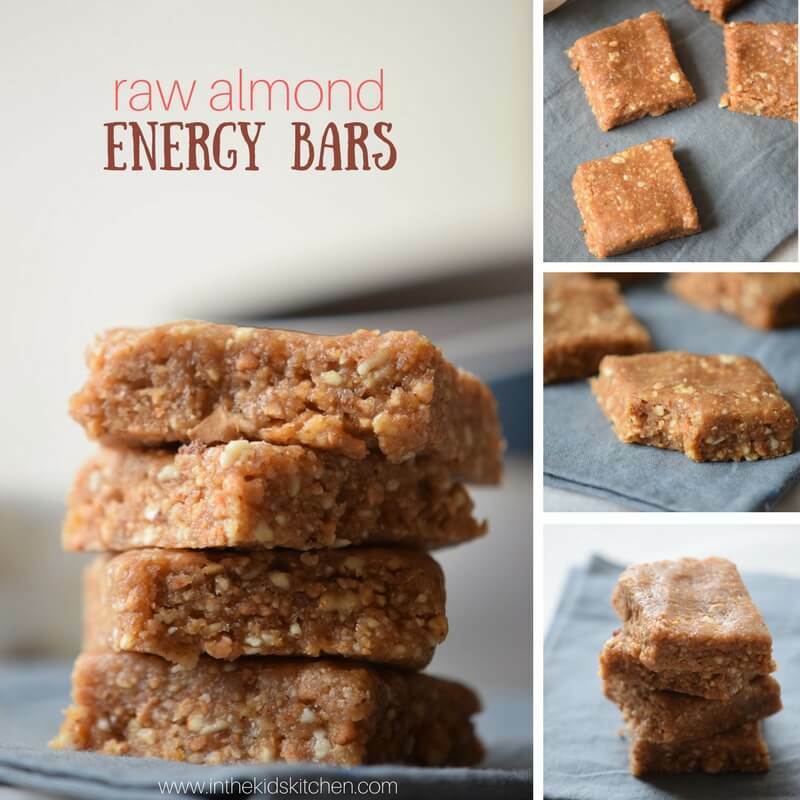 So when I want a bit of a sweet treat, these Raw Almond Energy Bars are a great solution to satiate my sweet tooth while eating healthy. This recipe is a contribution from our friend, Shelby from Fit as a Mama Bear. She is a rockstar mom to two under three, a fitness trainer and a nutrition coach. Check out her site for more of her delicious, healthy recipes – and for some great work-outs and fitness tips! She actually helped me retrain my body after a bad knee injury and I know she knows her stuff. These raw almond energy bars are inspired by our chewy chocolate protein balls. However this time, instead of creating individual bite-sized balls, we made more traditional bars. Our almond protein bars are the perfect handheld size and incredibly easy to make (only 3 ingredients!) Of course, you can roll these into bite-sized balls if you prefer! 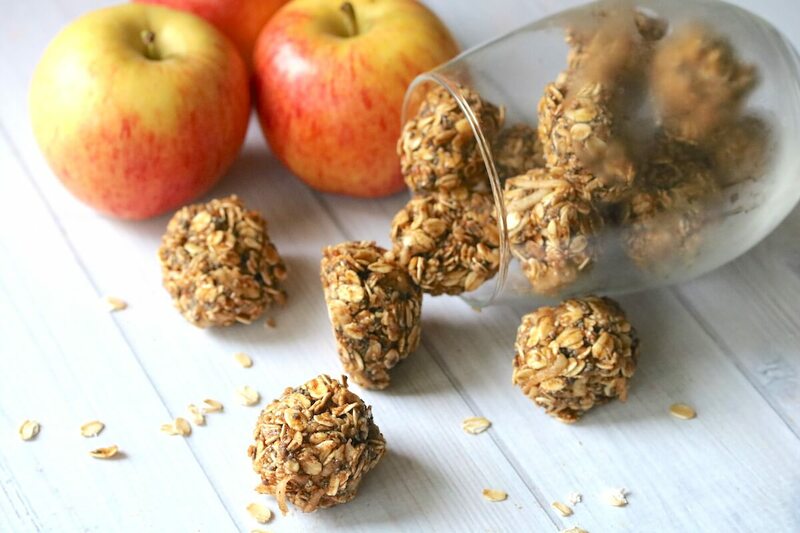 Grab one of these sweet and healthy treats to curb hunger on-the-go. They also come in handy when the kids are a bit peckish after school and you don’t want to ruin their appetites before supper. 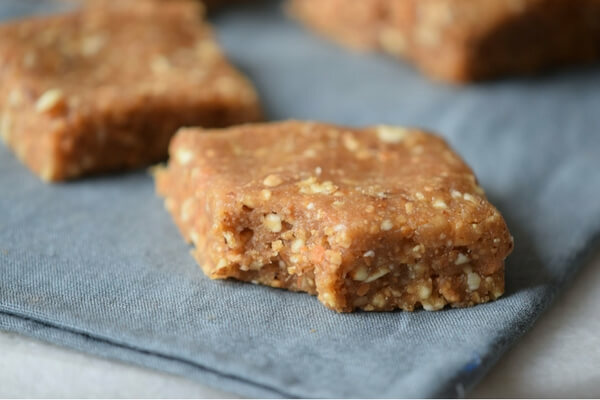 These subtly sweet homemade protein bars are absolutely delicious with a cup of coffee (if you’re like me and struggle with eating breakfast in the morning.) I also toss a couple in my bag when we we’re out running errands to resist the lure of the drive-thru! Hot tip: this also make a great addition to lunch boxes, if your child’s school doesn’t have a nut-free policy. Mine does, so I just pop them in my purse for pick-up time so that my daughter can have a protein-packed afterschool snack that keeps her satiated until supper time. Also, you can double or triple the recipe for these raw almond energy bars and freeze them in plastic bags or freezer-safe containers, with sheets of parchment paper or wax paper separating them to prevent sticking. Almonds are the king of all nuts, with more nutrients than all other nuts. It is a great source of vitamin E, calcium, phosphorus, iron and magnesium. Research suggests they boost brain and bone health, while also strengthening the immune system and reducing inflammation. They are truly one of the best snacks you could incorporate into your day! Tip: Add some cocoa powder for a healthy chocolate twist. Line a 8″ square baking pan and set aside. Place the almonds and walnuts in a food processor and chop for 2 minutes. Add the dates and process until a thick dough is formed. Fold the nut mixture into the lined baking pan and press down until it’s an even 1″ thickness. Related: For another healthy lunchbox or snack idea, be sure to try our Superfood Seed Crackers too! Line a 8" square baking pan and set aside. Fold the nut mixture into the lined baking pan and press down until it's an even 1" thickness. 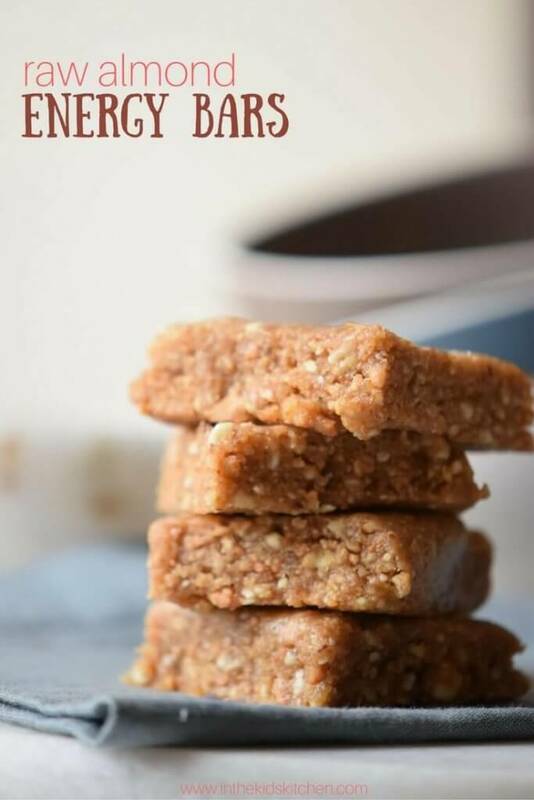 These healthy no-bake almond energy bars are a great way to transform your snack habits – especially if you’re not someone who would typically snack on a handful of nuts. They are a great option for afternoon munchies, or to ensure that you have a bite for breakfast on-the-go. And bonus: kids love them, too! You might also like our chewy chocolate protein bars with caramel drizzle and our healthy greek yogurt chocolate muffins recipe. Do you have the amount of carbs and sugar per bar? 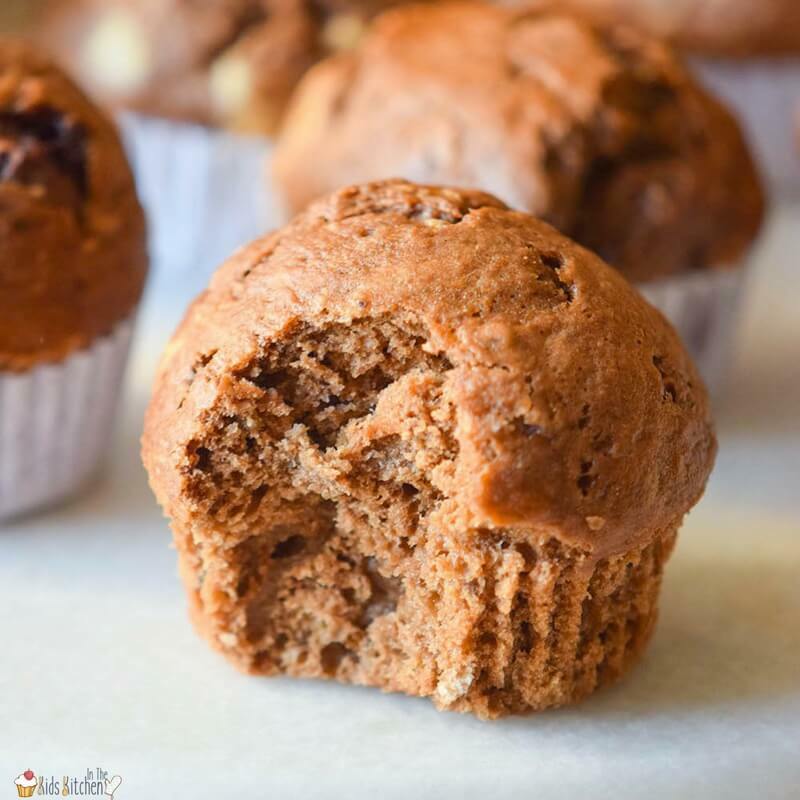 Hi Diana – This is definitely not a low-carb recipe, as dates are high in sugar (though it is a natural sugar and is actually low glycemic index food). The exact amount per serving depends on the ingredients you use (there may be small variations in brands/types) and the size you cut your bars. Thanks for information. I could not get all ingredients in the food processor.I dis nuts first add to bowl and did the dates separt in processor. I used a pastry blender to get the nuts and dates to blend. Worked very well. Dates pkg says 26g for six dates an 30g carbs. Almonds 1g sugar for 1/4Cup 6g carbs. Walnuts. 1/4cup 1g sugar and 6g carbs. Well see how a small portion works on glucose test. Hey on measuring the dates are they to be chopped first? Mine were kinda crumbly so re-did them with more dates and they are better. I did not chop the dates just put them in the processor.